This edition of That’s So 80s! 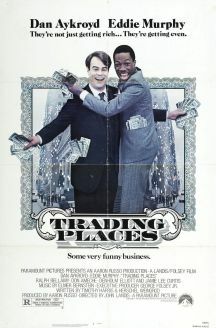 gets its retro comedy on with the hilarious way back cult classic TRADING PLACES, starring Eddie Murphy, Dan Aykroyd, and Jamie Lee Curtis. Think PRINCE & THE PAUPER, except this R-rated concept is less Mark Twain and more SNL. Still prevalent to contemporary times, this financial What If? scenario sees Murphy and Aykroyd switch stations in life – from poor to rich – after a bet by two old rich White guys.